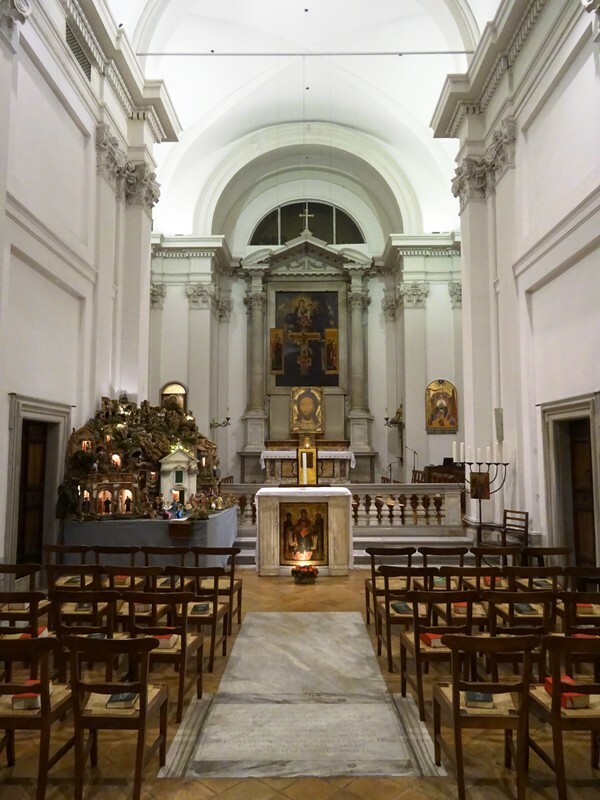 There is a fair chance that I would never have visited the small church of Sant’Egidio in Trastevere, had I not found it open on a mild winter evening in January of this year. I had walked past the simple facade of the church countless times, and since the gates were usually closed, I assumed the church was no longer open to the public. I was wrong. In fact, after I had entered the building – and turned out to be the only visitor – I received the warmest welcome I have ever had in a Roman church. I was approached by a woman who was serving as a guard and probably represented the Community of Sant’Egidio, the international ecumenical organisation that has been at this church since 1973. The woman offered me several brochures, both about the history of the church and the activities of the Community. 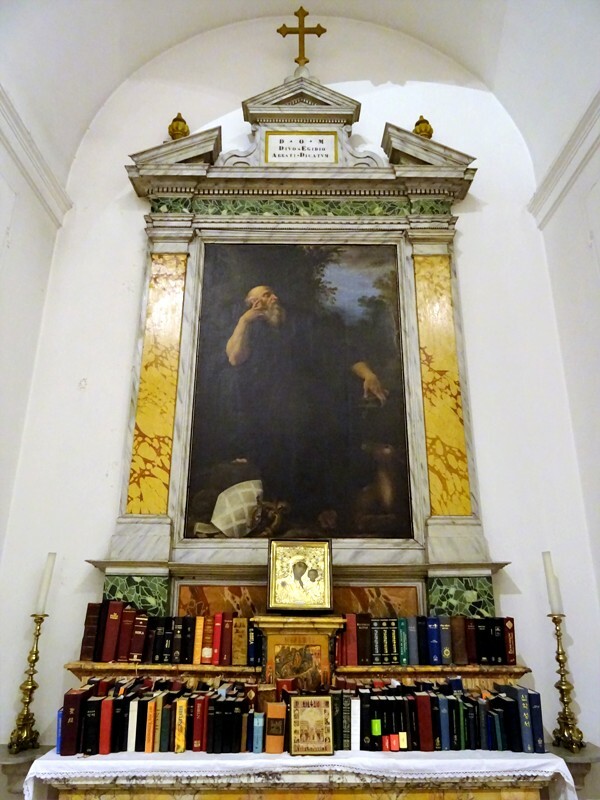 After thanking the woman and leaving a fair donation for the poor (the Community does some wonderful work in this field), I started exploring the church of Sant’Egidio. Since this is just a small church without any real treasures, my visit was a short one. In the Middle Ages, there were actually two churches at this location. The church of San Lorenzo in Ianicolo, from before 1123, stood a little to the south of the present church, very close to the large basilica of Santa Maria in Trastevere. The other church was the San Biagio in Trastevere, also in existence by 1123, which occupied the site of the present church. The former church was restored in 1610, rededicated to Saint Aegidius the Hermit (Saint Giles in English; see below) and then given to a community of Discalced (i.e. shoeless) Carmelite nuns. The latter church was transferred to a cobblers guild in the mid-1500s and renamed Santi Crispino e Crispiniano. Tradition claims that these two saints were martyred during Diocletianus’ persecutions at the end of the third century. Since they were shoemakers themselves, they later became the patron saints of people with this profession. The Carmelite nuns of Sant’Egidio later replaced the cobblers, who had to move to another church. The nuns now had two churches, and since they needed only one, they decided to demolish the Sant’Egidio – the former San Lorenzo – and to completely rebuild the San Biagio, i.e. the medieval church rededicated to Saints Crispin and Crispinian. The new church was jointly dedicated to the Virgin Mary as Our Lady of Carmel and to Saint Aegidius. It is generally known as the Sant’Egidio, but keep in mind that the medieval church of Sant’Egidio stood a little to the south of the present Sant’Egidio. The simple facade of the church mentions the year 1630 (MDCXXX) and this is likely the year in which the new church was completed. The facade also features two columns, symbols of the well-known Colonna family. The Carmelite nuns also had their convent here, while the Carmelite friars of Santa Maria della Scala had theirs just a little to the north. The nuns’ convent now accommodates the Museo di Roma in Trastevere. The church is co-dedicated to Saint Aegidius, also known as Saint Giles in the English-speaking world. He was a hermit from Greece, who lived in the seventh and eighth century. He later moved to Southern France, where he lived in a forest. According to legend, a hind allowed him to drink her milk. When the King of the Goths – more likely: of the Franks – and his hunters discovered the hind and shot an arrow at it, Saint Giles protected the animal with his hand. The king was much impressed with Giles and donated a piece of land to him. The saint built a monastery there and has been venerated as a protector of the weak and the poor ever since. Sant’Egidio or Saint Giles by Cristoforo Roncalli. The most interesting piece of art in the church is a painting of the aforementioned Saint Giles and the hind. It can be found in the left chapel (there is only one chapel on either side). The painting is the work of Cristoforo Roncalli (ca. 1553-1626), one of three painters nicknamed Il Pomarancio. It was painted in 1610, so it seems to have been executed for the previous Sant’Egidio, the former San Lorenzo in Ianicolo. The painting is set into a fake marble aedicule. On the altar of the chapel are an icon of the Madonna and Child and dozens of Bibles in dozens of languages. The Community of Sant’Egidio clearly operates beyond national borders. The church interior is very simple and mostly devoid of decoration. The church furthermore seems to have a strange predilection for Byzantine-style icons. On the high altar we find a large sixteenth century icon of Christ’s face (a Mandylion) from Russia. In front of the high altar is a lectern with an icon dating from the seventeenth century. It features another Madonna and Child with Saints Antonius and Theodosius (presumably Anthony the Abbot and Theodosius the Cenobiarch). To the right of the high altar is a modern Byzantine-style icon of the Pentecost. The altarpiece is a Baroque painting by Andrea Camassei (1602-1649), executed in 1630 and featuring the thirteenth century Carmelite prior Simon Stock. It was 5 January when I visited the church, which explains the presence of a very nice Nativity scene in the nave. It featured a miniature version of the church itself. Charming, just like the Sant’Egidio and the staff that administers it! Sant’Egidio concert in the Piazza di Santa Maria in Trastevere. 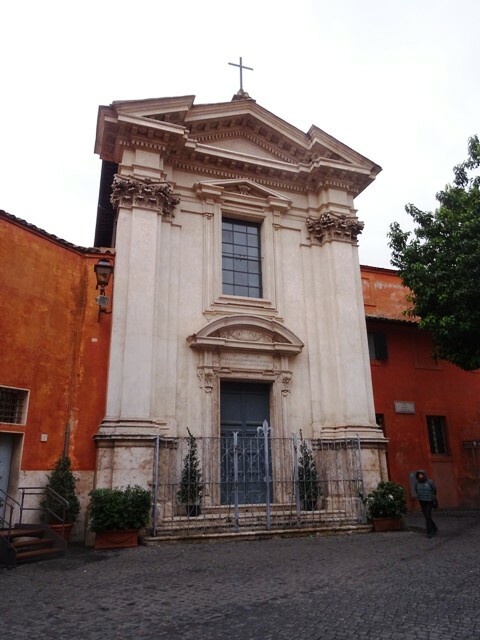 This post was mostly based on this entry on Churches of Rome Wiki and on information provided by the Sant’Egidio itself.